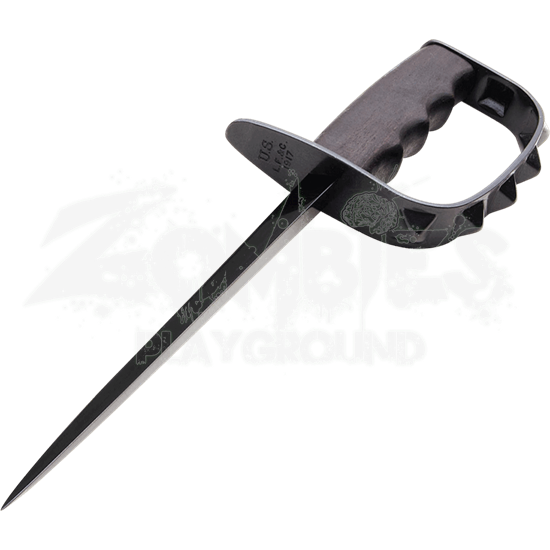 Close combat weapons such as the 1917 US Trench Knife proved their worth on the WWI battlefield. A replica of an existing original, this blade allows the collector or re-enactor to own a piece of history at a fraction of the price. Like its historical counterpart, the triangular blade is made of high carbon steel. A wooden grip with finger grooves and a stamped steel knuckle bow provide a solid hold. Pyramid shaped protrusions run along the outer edge of the bow. An OD green leather sheath with metal accents is included for convenient carry and storage.